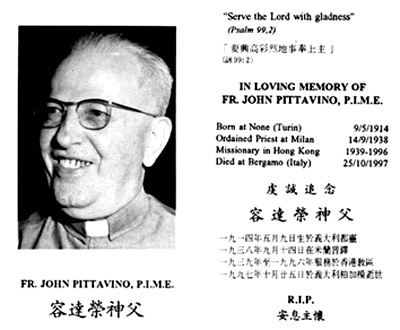 Father John Pittavino died at Sotto II Monte in the province of Bergamo Italy, the birthplace of Pope John XXIII, on 25 October 1997. He was 83 years of age and had been a priest of the Pontifical Foreign Mission Institute of Milan (PIME) for 59 years of which 57 were spent in Hong Kong. Born on 9 May 1914 in northern Italy, young John at the age of thirteen entered the PIME seminary and on 24 September 1938 was ordained priest at the age of 24. A year later on 25 August 1939 he arrived in Hong Kong. In February of 1940 Father John was appointed to Saint Margaret’s Parish, Happy Valley, where he was to remain for the next thirty-two years. From 1940 to 1961 he was an assistant Parish Priest and then in 1961 he was appointed Parish Priest, holding that position until the PIME Fathers transferred their administration out of Saint Margaret’s in November of 1969. He then again became assistant Parish Priest until 1972. While pastor of Saint Margaret’s he oversaw the completion of Saint Margaret’s School in 1967 and the redoing of the church building which was completed in 1968. In December of 1972 he was appointed to Saint Joseph’s Parish in Fanling, arriving there in January of 1973 where he remained as Parish Priest until 1976. During this time he was noted for developing the small Christian communities of the parish. In July of 1976, Father John was assigned to the Cathedral parish where he was assistant parish priest until 1987. Easily approachable, he had great rapport with the people of the parish. In 1987, Father John moved to Saint Anne’s parish, Stanley, and was in charge of that parish until 1989 when at the age of 75 he moved to the Diocesan Centre to live in semi-retirement. However, he continued to exercise the priestly ministries of saying Mass, hearing confessions and visiting hospitals and prisons. During this period also he was a member of the Diocesan Conciliation and Arbitration Board of the Catholic Diocese Centre, a post which he retained until 1996 when at 82 years of age with health failing, he retired to Italy to live at the PIME retirement home in Sotto II Monte where until the very end he continued to be active. Masses were offered in Hong Kong on Friday, 31 October at Saint Margaret’s Church and on Friday 7 November at the Cathedral where many friend honoured his memory and prayed for his soul.